Before long, “Steppin’ Out” hit #5 on the Club Play chart on Billboard. Peep an extended version of that straight from his recent Redux tour below. He worked had, dropping album after album. In 2008, he collaborated with deadmau5 on some of the most crushingly beautiful dance music to ever be created. This collab will go down in history as the greatest thing ever to come out of the partnership between America and Canada. The shimmering chords built on the old school techno & trance build ups but with a polish and shine that the world had never heard. The haters hated, but the world fell in love. To be clear, this sound was one of the new sounds I believe are structurally responsible for drawing the currently maturing EDM crowd that the USA is seeing. “I Remember” was played in a million dorm rooms across the country, with “Move For Me” cracking the Top 15 UK Singles chart. I have no doubt 90% of the people who are buying tickets to festivals in the US or the UK these days have a story associated with these two genre-disrupting tracks. This could’ve been enough, especially riding that slow burning, pushing, deep sound, and turning that into a career, but he didn’t stop there. Dynasty showed up in 2010, notching him another #1 hit on the US charts. The steamy, glitzy beat that stays building but never crests keeps the energy high without getting too big or uncomfortable. Exactly what it needed to be. While I wasn’t at Ultra in 2012, you heard about Kaskade & t Armin Van Buuren closing the place down on Sunday, and off we went. His Atmosphere tour was insane, and he straight gifted it to his fans, with that album being nominated for Best Dance Electronica/Album, and the single up for Best Dance Recording. Yes I opened w/ it’s you it’s me last night. Yes the song is 11.5 years old. No I don’t regret it, the song STILL works. That’s right, the stuff earlier on in the post is actually relevant at the end. That’s from Mysteryland, where he opened with a track you just listened to, if you’ve been playing along. And he knocked it out of the park, even though they misspelled his name on the T-shirts. His parties are still dope and if you made it to one of the Redux shows (I sadly didn’t), you’d see why he gets all the love from people who know what’s up. And he releases tons of free tracks, because he understands that the whole point of the internet is to get people to listen to your stuff so they’ll enjoy it, maybe buy some and maybe see Kaskade play. I certainly plan to the next time he’s in town. You should too. He’s good for what ails ya. P.S. This is the track I was talking about at the beginning, MIA to LAS, it’s wonderful. 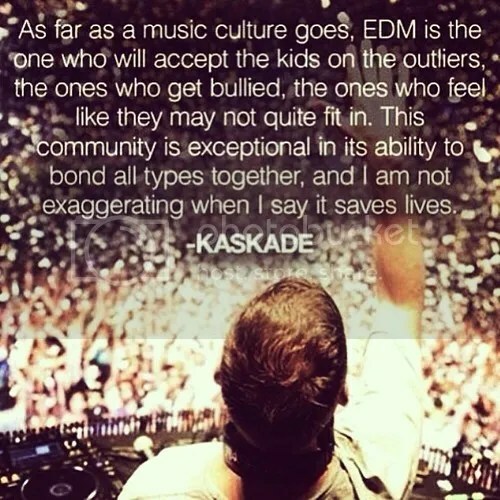 Kaskade rocks. P.P.S. Can deadmau5 and Kaskade PLEASE do a North American tour? The two of them could sell out Madison Square Garden and the LA Colosseum in 24hrs. This entry was posted in News/Lolz and tagged America, deadmau5, EDM, Kaskade, soundcloud, YouTube. Bookmark the permalink. ← Ayah Marar Gets Ready For The Weekend With NERVO & R3HAB!